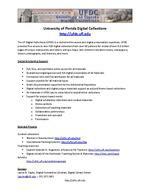 Handout on support for Digital Humanities and Digital Scholarship from the UF Libraries. Original loaded 5/2011 and updated version loaded on 7/24/2013. historic photographs, oral histories, and more.